The Lemurian Crafts was developed to provide a hands-on way for students to apply the ideals and principles learned from their Lemurian studies in an intensely practical environment. The Lemurian Philosophy can be best described as a “works/worship” religion, and the Crafts provides an arena for the practical application of Lemurian principles, thus furthering the spiritual teachings of the Fellowship. Students who have earned Lemurian Order membership can participate in this arena, no matter their skill level. The training and human interaction provide ideal opportunities to enhance character, so essential to spiritual progress. By using the Crafts as a practical expression, these artisans learn patience, concentration, efficiency, and precision as they work together making products of rare and outstanding beauty. They are as interested in their associates’ success as in their own, furthering the creation of a harmonious organization. The goal: to develop a community intent on making the brotherhood of humankind a practical, workable reality. From its beginning in 1948, the Crafts has worked with some of nature’s most beautiful materials – rare and unusual woods, semiprecious stones, onyx, marble, brass, and bronze – creating woodturnings, decorative boxes, lamps, artwork, violins, and architectural door and cabinet hardware. 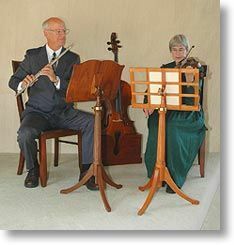 The Crafts currently creates elegant music stands, cello stands, stands for displaying a violin or viola, and sells these, in limited quantity, to a select few, exclusive music stores. The items produced are distinctive for their beauty, simplicity of design and meticulous craftsmanship. The skilled (or fine) carpentry is performed by volunteer members trained and supervised by experienced members of the staff. 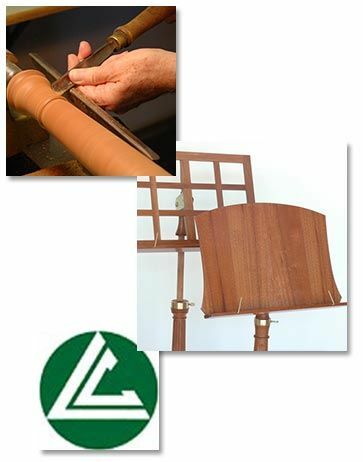 Throughout its history, the Crafts program has involved the art of carpentry, the profession traditionally believed to have been practiced by Jesus prior to his ministry as Christ. For further information about Lemurian Crafts products, including retail dealers, click here to email us.